This weekend, Leslie Thompson's Farm to Food Truck will take its maiden voyage. With dates at Burlington Beer Company (Saturday, August 16) and Shelburne Vineyard (Sunday, August 17) and additional visits to area breweries, farmers markets and events to be announced, Thompson says she's excited to get started. Farmers market regulars may recognize Thompson; she's been serving food from a tent at local markets for several years. She grew up raising fowl at Cavendish Game Birds of Vermont and frequently helps her parents sell their birds. 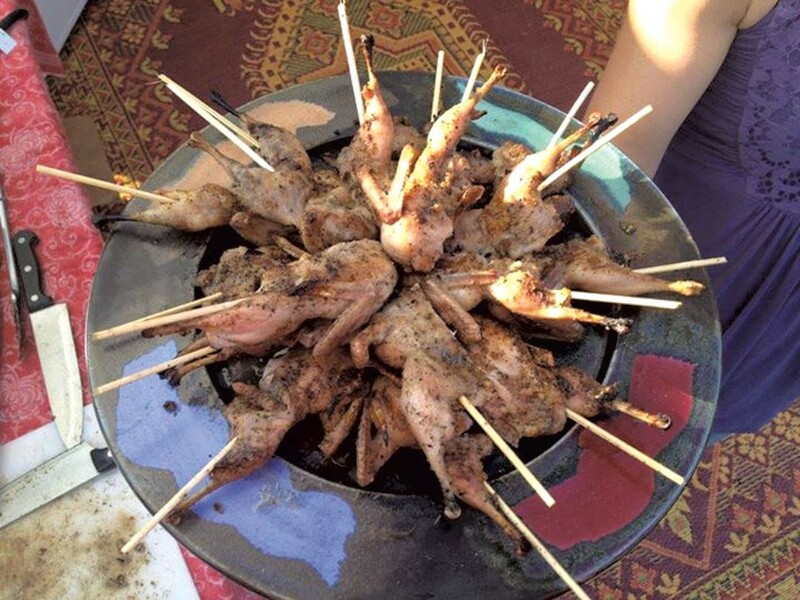 Thompson's menu features quail kabobs, grilled quails on a stick, deviled quail eggs, bacon-wrapped quail legs and pheasant tacos, all sourced fresh from the family farm. Folks looking for more down-to-earth options at Farm to Food can snack on simple dishes such as burgers and boneless chicken wings (from Maple Wind Farm) with blue cheese dressing (with cheese from Jasper Hill Farm). "I love gourmet food," Thompson says, "but I love comfort food, too ... The most important thing is where the food is coming from — and [with the truck], that's family farms with a social and environmental mission." Thompson views the project as part of a larger mission to engage the community. "I'm trying to make a living," she says. "But the real reason behind this is to do something that matters." One percent of proceeds will go to the Vermont FoodBank's gleaning program, Thompson says, which picks up excess produce from farms and distributes it to food pantries. She hopes to use the truck to help incubate other food startups. "I want the truck out there every day," she explains. "But I can't be out there every day, and there are so many chefs and farmers looking to start new businesses, I'd love to find a way to rent it out." Thompson says she's enjoyed a lot of support putting the project in action, and now she's looking to pay it forward. On Tuesday, August 19, Thompson will hold a kick-off bash with live music, brews from her friends at Four Quarters and additional food vendors, including Matt Sargent's Phantom Productions truck. Thompson says she'll announce the location and lineup on social media once they're finalized; right now, she's focused on getting the truck on the road. "It's never been cooked in before," she says. "It's beautiful ... It's kind of a miracle that it all worked out. I'm kind of pinching myself." Correction 08/13/14: This story has been edited to reflect changes to Thompson's schedule this weekend. The original print version of this article was headlined "For the Birds"